What impresses me about the ICFA is that the people who attend are so generous and open to conversation. The lofty and remote mystique of “The Great Author” is punctured and leveled by the membership’s willingness to meet others and engage in personal exchange, regardless of status or fame. Attending is an exercise in gregarious humility, a drawing back of the curtain to reveal that we all possess a deeply shared passion for good imaginative stories written well by our members. My first experience in attending ICFA was in 1993. I’d managed some success in the more traditional academic conferences, but was nervous about breaking into the community of SF/F scholars and writers. I showed up early enough to attend the Thursday evening hors d’oeuvre reception, not knowing anyone there and not sure what to expect. I was greeted at the door by Roger Schlobin, who was eager to help me avoid the peripheral wall-flower discomforts I was feeling. He asked, “Who would you like to meet?” and I mumbled something about having been a big fan of Roger Zelazny’s work. He said, “Oh, sure, he’s just over there,” and he walked me right up to the table where Zelazny was sitting with Brian Attebery, Chip Sullivan, Brian Aldiss, Bill Senior, and Jane Lindskold. I was astonished and nearly unable to speak! They welcomed me to sit, and I was encouraged to join the conversation. I have no idea what I said there, but have a strong memory of gratitude for the chance to converse with such great people! Zelazny was the GOH the following year, and I wrote an Amber essay for a session that he attended, sitting nearly front and center. It was one of the most deliciously uncomfortable presentations I have ever made: effectively telling the author what it was that he had written. Afterward there was wonderful discussion and what I retrospectively identified as real camaraderie. 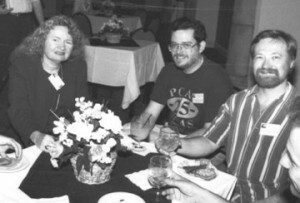 Also in ’93, Ursula K. LeGuin was the GOH and luncheon speaker. She and Brian Attebery had just edited a Norton anthology of SF for which she had written the introduction. Her talk was brilliant, of course, but I really perked up when she claimed that some task (I’ve forgotten which) was “as difficult as learning Tai Chi.” I was intrigued because some years ago I had learned a short form of Tai Chi and had been sharing my understanding of the art with friends back home. (Actually, I’d been asked to teach it, to my Caucasian chagrin, and had become a Sifu or Lao-shi, a teacher of the form.) I determined to ask her about that reference after the luncheon. When the event had ended, I looked for her, but she had escaped the room. I went out into the hotel lobby, but did not see her. I looked outside the front door, but again could not find her. On inspiration, I walked into Rumors, the detached bar that stood across the entrance circle, and sure enough, she had found respite and solitude, and liquid fortification. It was a risk of intrusiveness, but I approached her, introduced myself, and asked about the reference to the difficulty of learning Tai Chi. She said she and her husband had been learning it, but they had become stuck at position 97. She stood and showed me where she was having trouble, and then she and I tried un-sticking her from the “Eagle Searches Sea Bottom” position. It seemed quite natural to be doing Tai Chi with Ursula LeGuin in a Florida bar-the kind of “unanticipatable” experience that commonly happens at ICFA, and the reason I love to attend. The same feeling of inclusion hit me a few years later. 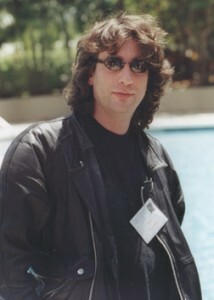 I was “chuffed”: Neil Gaiman was going to be a Guest Writer at the 2000 ICFA. I had been enamored of Neverwhere, and used it in an Introduction to Literature class with great success. A week before the conference I learned I could order a copy of the BBC television series for which it had been conceived, and offered to Donald Morse that I would be glad to screen it during the conference. The organizers found a slot for it and all seemed set . . . except that the delivery was to be to the hotel and it did not arrive as promptly as promised. In fact, it arrived on the day after the scheduled screening. A room was found for Saturday, opposite a panel I was chairing, and Gaiman offered to introduce the show! At the appointed time we walked into the room to find no TV/VCR in place. Gaiman and I looked at each other, and without comment, slinked down the hall to an unoccupied room, where we gleefully stole the TV/VCR and hustled it, nearly knocking it over, into the right room, where about 30 conferees had assembled. I’m sure we had an eldritch look in our eyes. While I frantically got the cables hooked up and the signal correctly sent to the TV monitor, Gaiman gave a wonderful introduction and then stayed for more than an hour of the production. I’ve listed on my CV that I have stolen electronic equipment with Neil Gaiman as my co-conspirator. So I ask, where else could I have lectured to an author about his work, danced with a preeminent feminist, or engaged in larceny with the lord of dreams? And so in sum I believe it is this that has brought me back to ICFA again and again. To paraphrase Charlton Heston from a famous SF movie: ICFA? What’s ICFA? ICFA is People!! !